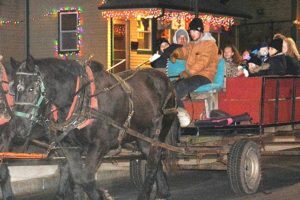 A horse-drawn hayride passes Hudson AMVETS Post 208 on South Street. Photos/Ed Karvoski Jr.
Hudson – Several recently-opened businesses joined established mainstays Dec. 1 for the 16th annual Hudson Downtown Holiday Stroll. This year’s seasonal celebration shone brighter thanks to new LED bulbs donated by the Business Improvement District for the town-owned wreaths and garland decorating the downtown light poles. Merchants offered strollers refreshments or activities such as cookie and ornament decorating, seasonal crafts and a live petting zoo. Strollers also roasted marshmallows courtesy of Hudson Rotary Club before boarding the popular horse-drawn hayrides departing from Robinsons Hardware. 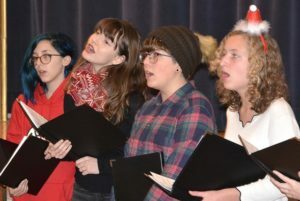 Live entertainment at the Town Hall featured a cappella groups Hudson High Notes and Camerata, River’s Edge Chorale and REHarmonix, and highlights of Metrowest Ballet’s “The Nutcracker.” New this year at the rotary’s Odd Fellows Building, local artists’ creations were displayed while pianist Diana Mascari played holiday music. 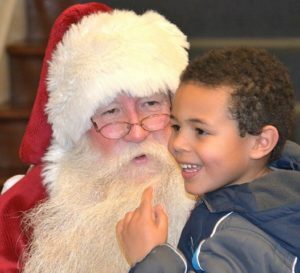 Santa heard kids’ holiday wishes inside the Town Hall before and after leading a tree lighting outside. Architect Glenn Davis donated the tree. Presented by Hudson Business Association, the event’s major sponsors were Hudson Appliance, Main Street Bank and TD Bank with support from local businesses and community leaders. Serendipity owner Lori Burton served as event chair. 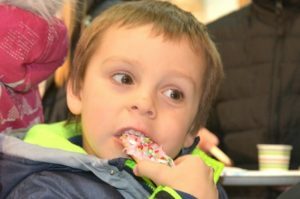 Jaxon Bastis, 5, samples the cookie that he decorated at Wright Jewelry. Hudson High students of the a cappella group Camerata perform at Town Hall. Santa Claus meets A.J. Wade, 5, in the Hudson Town Hall lobby. 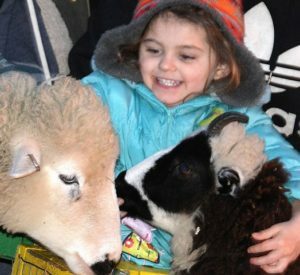 Aubrey Aponte, 4, pets sheep at the Main Street Bank parking lot. 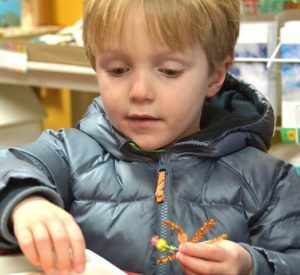 Connor Putnick, 5-1/2, creates a snowflake at Serendipity. 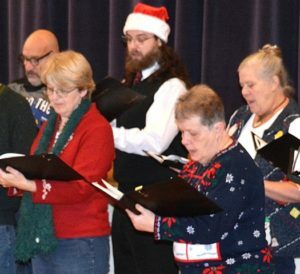 River’s Edge Chorale vocalists perform at the Town Hall. 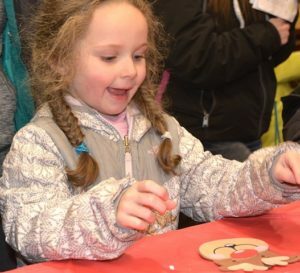 Arianna Russell, 4, makes a Rudolph ornament, offered by Hudson Garden Club at Avidia Bank.